Ultra-fast speed is what the D-Link AC3200 review will review about this router, it possesses the capability to connect smartphones, tablets, laptops, desktops, game consoles, your Smart TV and anything else you want to utilize to stay connected. Take note, it can handle everything at the same time, seamlessly with uncompromised speeds and matching ultra performance to meet your demands. Find out what makes the AC3200 Ultra Wi-Fi Router (DIR-890L/R) the best gaming router factoring information on its internet speed, design, and performance with the many features it holds. Read our D-Link AC3200 review to find out more. The D-Link AC3200 executes a faster network speed with a powerful 1Ghz Dual-Core processor. Where most routers are leveraged upon, offering typically a 2.4Ghz and 5Ghz band, one distinction of the DIR-890LR of being the best gaming router lies in its Tri-Band capabilities. This feature theoretically increases what the router can handle, incorporated with an additional 5Ghz band. If each band performs at optimal speed simultaneously, at 600 megabits per second on the band which has 2.4Ghz and at 1300Mbps on the two 5Ghz bands, it would deliver breakthrough wireless speeds of up to 3200Mbps or about 400 MBps. 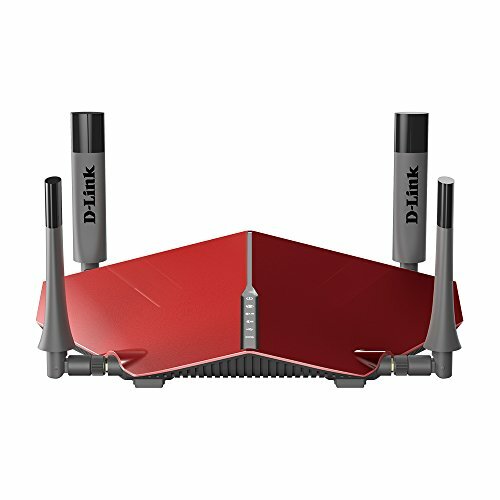 Many who have purchased an experienced the D-Link AC3200 DIR-890LR Ultra Wi-Fi Router attest to its consistent and reliable speed compared to other routers. The Smarter Bandwidth ensures that traffic is distributed through band steering technology for outstanding Wi-Fi performance. There's no dead zone with the Advanced Ac SmartBeam which lets you track connected devices for an even more enhanced Wi-Fi experience as you move anywhere around your home. While the Remote Access and management empowers you with full control over your network with your handy smartphone or tablet. The user-friendly interface makes controlling features easier than most routers. This allows for the sustainability of maximum performance, matching your device automatically with the best connection according to your usage. The Smarter Bandwidth of this exceptional router overrules any hindrances that tend to slow down network speed, such as older Wi-Fi devices. USB 3.0 & USB 2.0 slot and 4x Ethnernet ports. Executes best for HD media streaming and online gaming, done on multiple devices. This router lets you enjoy an uninterrupted connection and stream videos in noticeable and ridiculously fast speeds. This Wireless Router comes packed with an Ethernet cable, a power adapter, a small quick start guide booklet and a Wi-Fi configuration card, a warranty and of course, the router itself. Microsoft Windows 7 / 8 / 8.1. Very powerful! Ideal for online multiplayer games, movie streaming in every video definition including 4K! Very strongly secured with top speeds and lots of features like parental control there's no doubt that this router is ideal for Online Gaming and Movie/Video streaming. We hope you liked our D-Link AC3200 Review and if you have questions or suggestions feel free to send us a message, we are always looking for new ideas.